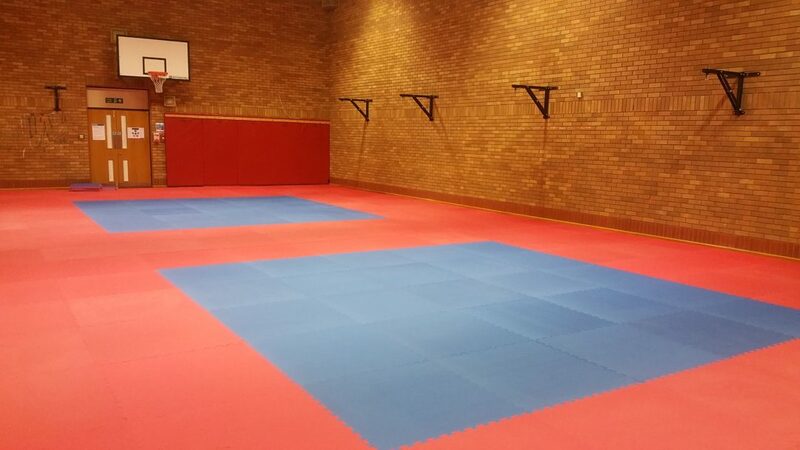 Northumbria Police got in touch, requiring matting for their gym in which their officers train self defence and restraining techniques. As part of their training, officers are required to run on the mats as part of a fitness test, warm up and perform take down drills. Handcuffs, batons and small amount of water (CS Spray Training) are also used on the mat as part of the training. With 24 officers training per day, the mats needed to be durable enough to withstand the amount of usage in addition to being thick enough to soften the impacts from takedowns. The mats also needed to have grip and be firm enough to run on as well as waterproof for the water being used on the mat. After discussing various options, they decided to go for Jigsaw Mats, opting for the Promat 40mm red/blue standard finish jigsaw mats. The 40mm thickness of the mats provides the optimum impact cushioning (this thickness of mat is used for Judo, Sambo and Jujitsu) whilst also providing the firm surface and waterproof qualities which were required. We visited the Northumbria Police’s gym and completed the install in a short period of time to ensure it was finished in time for Christmas.